Are you looking to make improvements to your house? Do you need an experienced joiner in Northwich to undertake the work with care and precision? Look no further than R W Joinery right here in Northwich. We provide a professional, trusted joinery service that’s certain to exceed your expectations. General joinery work predominantly relating to the repair and replacement of household woodwork, including: skirting boards, architraves, doors, stairways, rails and bannisters. Construction and design of one off, custom woodwork installations, including: fitted wardrobes, shelves, seating, cupboards and storage in unusual or restricted spaces. 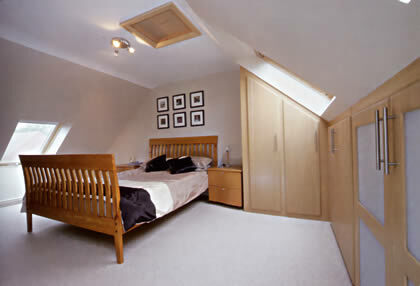 We supply the complete service from Preliminary Loft Design Ideas, Complete Installation and a final dusting as we leave. Phone us today for a helpful chat about how we could turn your dark loft into your dream room. Installation of garden fencing in a variety of materials, You can rely on us for garden fencing in Northwich and fencing products which look fantastic, fit their purpose and last. Our skilled team can supply reliable service throughout Northwich and surrounding areas. Curving or straight, simple or intricate, banister or balustrade, our wooden staircases settle into your home with a solidity and charm that other materials cannot match. Our complete joinery consultation service guarantees that you end up with a wooden staircase that fits your expectations. Custom design and installation of new fitted kitchens, or refurbishment of existing fitted kitchens, including complete project management. Our joiner in Northwich takes care of everything, installing the kitchen furniture and organising our plumbers and electricians, we keep customers fully appraised of the process continuously, completing installations on time to the very highest of standards. Design and installation of garden decking areas – Decking areas in the garden provide great extra space which for the most part can be used all year round as a play area, a romantic place to dine throughout the year, a place to just kick back and relax as well as as an ideal area to host a barbecue. Decking is pretty easy to install and is a cost effective too. Decking is an easy way of adding some of the wow factor to your home. R W Joinery install fitted bedrooms in Northwich, sliding wardrobes and home office furniture in Northwich and have supplied fitted furniture, to several of the big contractors, “in their show homes” and to their clients on their developments, with this R W Joinery bedrooms have developed a substantial customer base, with countless testimonials. Local Joiner Offering a Range of Services.